I’ll be writing periodic articles over at Local Tourist Ottawa, mostly about agritourism, but also about some little-known tourist destinations I’ve discovered in my rural travels. 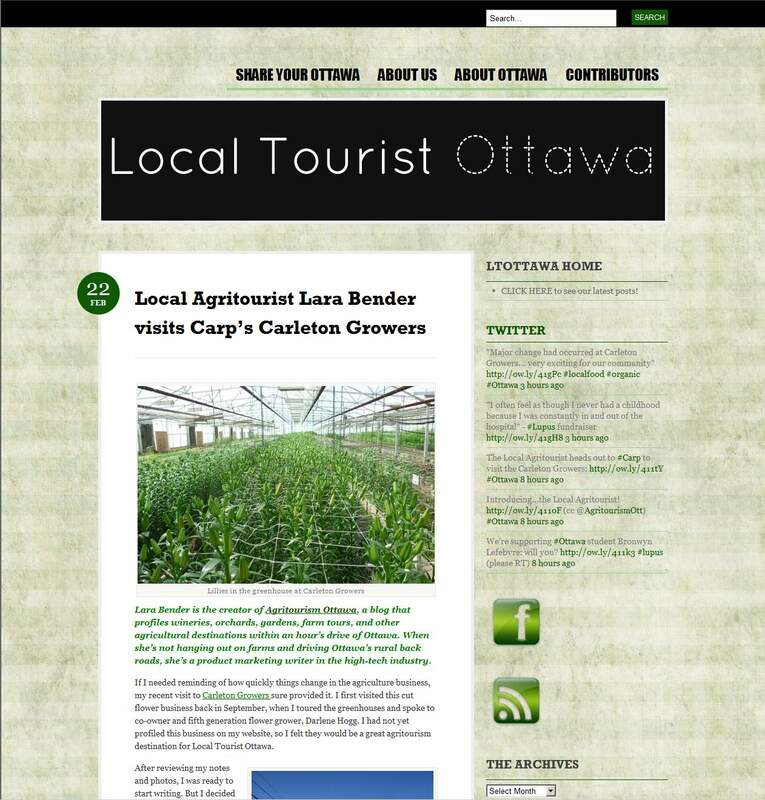 I’ll let Agritourism Ottawa readers know when I’ve posted something new at Local Tourist Ottawa, but even better, why not follow both blogs regularly? Don’t forget to also follow us on Twitter at @LTOttawa and @AgritourismOtt! I’m excited to report a couple recent developments pertaining to this blog. First, a big thanks to the OttawaStart blog, which named Agritourism Ottawa as one of its 30 “very strongly recommended” blogs about Ottawa. I am very honoured to have been put on the list! 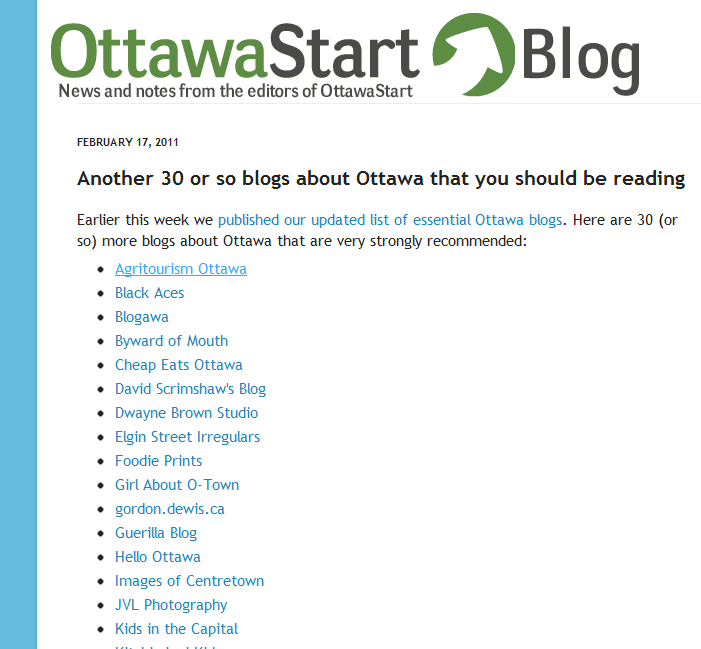 Thank you also to any new readers who followed the link from the OttawaStart blog. If you want to get updates through RSS or email, just click the Subscribe button on the left hand side. Earlier in the week, OttawaStart also published its list of 26 “essential Ottawa blogs”, which represent the very best blogs in the region. This is where I learned about a recently launched blog called Local Tourist Ottawa, which features articles from local writers about places to explore in Ottawa. I contacted the blog coordinators to discuss contributing to their blog, and my first blog post is now in the works! I will post more here when the article is published, but I will say that the article includes news that will thrill organic food lovers, especially in the west end of Ottawa! In other news, the maple syrup season is now starting (Fulton’s opens today! ), so stay tuned for profiles of the best sugar bushes in the region. 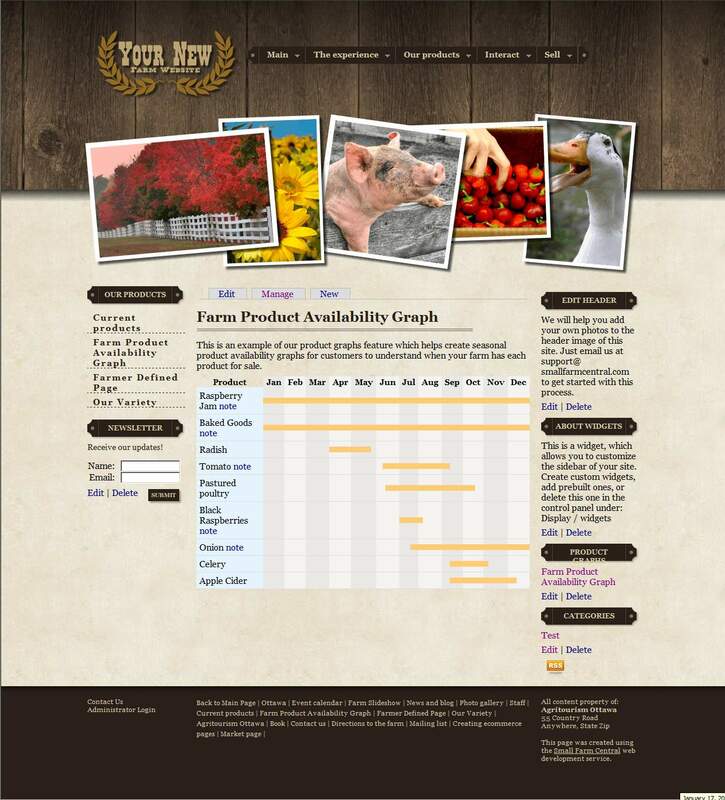 I recently came across a great web site hosting service specifically designed for farmers. It’s called Small Farm Central, and it was started by Simon Huntley, a farmer himself. Website hosting: They’ll register your domain name for you, host your website files on their servers, and take care of backups. Website editing tools: Their content management interface enables you to make changes to your own site – with no web development experience required. Graphic design: They provide beautiful farm-themed website templates that make it look like you hired your own web designer. E-commerce enablement: They provide the tools to enable online purchasing and order management through your website, saving you time and increasing your farm revenue. A couple months back, I wrote about a food co-op in Gatineau, Quebec called Marché de solidarité régionale de l’Outaouais. This local food distribution cooperative offers products from the Outaouais region’s farmers, manufacturers, and artisans. For a 15% premium over the producer’s regular price, customers can place their orders online and pick up their order at a downtown Hull location. The cost to join is $20/year. I decided to join this co-op for a couple reasons. One is that the co-op includes some of my favourite producers in Ripon, Quebec, including Ferme Fée et Fougère (organic meat), Ferme aux Pleines Saveurs (organic produce and amazing strawberry pies), and Fermes Les Folies Bergères (sheep cheese). The other reason for joining is that the co-op sells wine and ice cider from some terrific Quebec wineries. 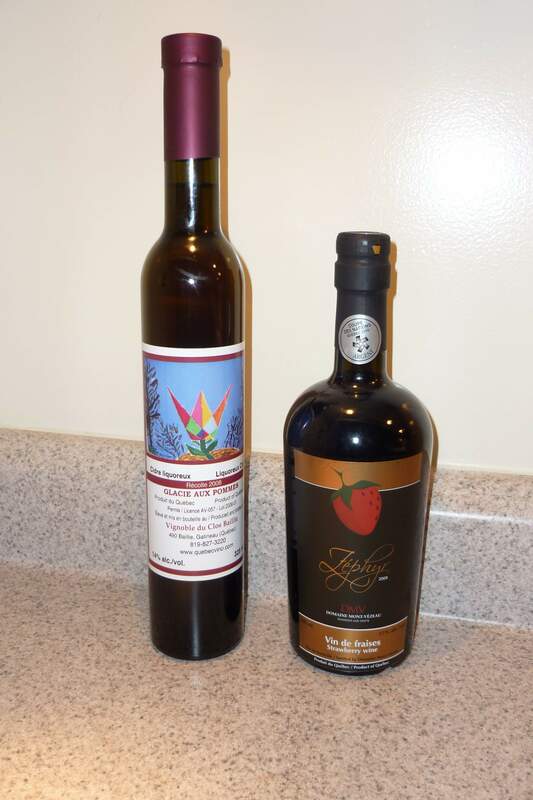 My order today included strawberry wine from Domaine Mont-Vézeau and ice cider from Vignoble du Clos Baillie. In the future, I will order ice wine from Verger Croque-Pomme, and the 2011 organic wines from Domaine des Vignobles Météores. When I explain my agritourism book project to friends, one of the most common questions I get is: “how do you find the places you’re visiting?” People are curious about how I go about my research. 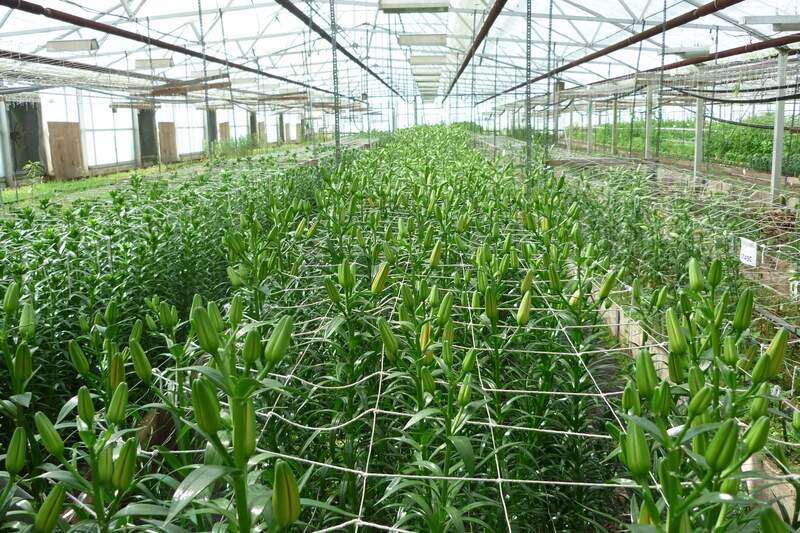 In particular, they want to know what kind of web resources there are for planning farm visits – especially for the less well-known destinations. For the last three months, my freezer and fridge have been overflowing with local products: apples, tomatoes, beef, bison, maple butter, cranberry juice, goat cheese, Beau’s beer (if you can call that food), and a multitude of other products available from our local producers. I’ve been lucky enough to be able to visit these producers on site, buying directly from the farm. But many of these places are a good drive from my house, so replacing the food as we eat it is not so easy.